Maintenance | VANKLEEF HEATING AND AIR CONDITIONING , INC. When you are cooling your home, your HVAC system draws in warmer air and passes it through a chilled coil. As the warmer air cools it is also being dehumidified which causes condensation. 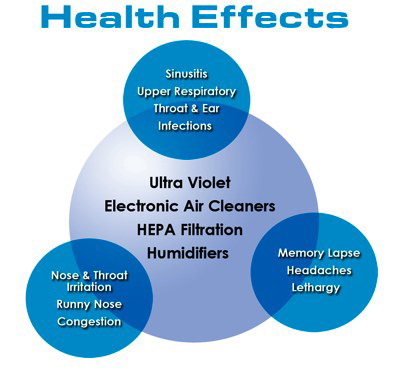 As the air cools, water vapor can build up on the piping on the inside of your system. Mold loves places that have two specific features: wet and dark environments. When you combine wet and dark you get a place where mold can grow. VanKleef Heating and Air Conditioning has partnered with York, Lennox, Trane, and more products and they have a solution to the possible problem of mold growth UV light. If you think you may have mold growth inside your HVAC system, we can test it by removing the cover of your cooling coil compartment and visually inspect for the presence of mold. If mold is present you will want to have the coil compartment cleaned and will want to seriously consider having a UV light system installed. Remember that the mold spores, bacteria, and viruses can not be seen with the naked eye, but UV light will kill them all. You can buy test kits that will tell you if mold spores are present in your indoor air. Not all of them are accurate so a visual inspection of your cooling coil would be more advised. “Is it really necessary to have semiannual HVAC maintenance? It cools. So, it must be working correctly!” Well, folks, does your car run with dirty oil that hasn’t been changed in 20,000 miles? Sure it will run. However, you are shortening the life of your engine and it’s operating inefficiently. The same is true for your air conditioning system. Every year that your system operates causes degradation of certain wear components – contactors and capacitors. These components should be monitored and replaced as they fall from outside tolerance specifications. A pitted contactor causes undue stress on the compressor. If pitted enough, there will be a serious voltage drop causing high energy consumption and eventual early life failure. The same is true for capacitors. These little “batteries” allow the motors to run efficiently. Once outside their normal values, the motors are inefficient, draw more power, and ultimately fail. A cooling season tuneup also includes a good outside coil washing and system monitoring. A biodegradable coil cleanser will loosen the dirt and debris and allow the technician to flush the coil with water. Spraying from the outside in is not recommended as it further impacts the debris. The bottom line: maintenance is important and should be done every cooling season to insure optimum performance and a longer life for your air conditioning system.